Sometimes kids have a hard time understanding that they need to eat healthily to keep themselves fit and healthy. And who can blame them? A large chocolate bar is always going to look more appetising than a banana! However it doesn’t have to be difficult to get your kids to fill up on good food if you follow some simple tips. The best way you can encourage your children to eat well is to implement a healthy diet when they are very young. Children develop food dislikes and likes very early on in life, and introducing them to healthy foods when they are small can help determine their eating habits. Sometimes, children will rebel and eat unhealthily when they reach their teens and have a bit more control over their diet, but studies show that people who ate healthily as children more often than not revert back to those habits as adults. Be a good role model and practise what you preach. If your children catch you tucking into a large bag of crisps or chocolate they are going to find it very odd that they are not allowed to eat like that themselves. Young children take inspiration from their parents and will consider anything you do as the “correct” way so any bad eating habits should be ditched. Make it easy for your children to eat healthy snacks by having them available at all times. Keep fruit in a bowl that they can reach easily and allow them to pick out pieces whenever they feel hungry. This is a great way to stop them reaching for unhealthy snacks in between meals, and it allows them to have some control over their food intake, which small kids will love. Everyone knows that restricting any type of food will make you want it even more – the same applies with children. By allowing them a small amount of chocolate, sweets or whatever they fancy every week, they will not feel as if any foods are off-bounds, making it easier for you to encourage them to eat healthily the rest of the time. By allowing them to cook healthy dishes with you they will start to enjoy being around healthy foods and relish watching what can be done. Show them all the different colours and textures of foods, and ask them for their meal ideas so they feel as though they are in charge. 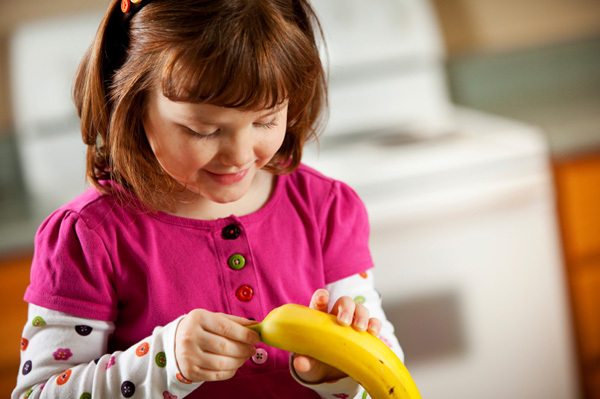 Kids also love playing with food, and games such as a taste test can make healthy food all the more enjoyable. Try blindfolding your kids, cutting cucumber and carrot sticks up and dipping them in healthy dips such as hummus. Then let them guess what they can taste. Experts believe one of the leading reasons for the rise in obesity is due to the huge increase in portion sizes over the last 20 years. By teaching your children to limit how much they put on their plate, you can help protect them from the health problems of being overweight. If they are eating out or at school, let them know it is OKk to leave food on their plate if they are full and not to overeat for the sake of it. Are you teaching your kids healthy eating habits?